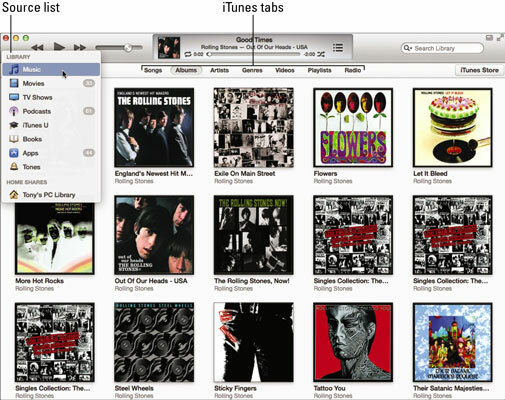 Music: Shows the songs and music videos purchased, downloaded, imported, or copied into the library. This choice also shows Internet radio stations. Movies: Shows movies downloaded from the iTunes Store and video files you’ve added to your library. TV Shows: Shows TV shows downloaded from the iTunes Store. This choice also shows video files you’ve imported and then changed to TV Show in the Media Kind pop-up menu of the Options pane of the Info dialog. Podcasts: Shows the podcasts you’ve subscribed to. iTunes U: Shows courseware, lectures, and other items downloaded from or subscribed to in the iTunes U section of the iTunes Store. Books: Shows the audio books downloaded from the iTunes Store or from Audible.com, and electronic books downloaded from the iBookstore and other sources (such as PDF files from Project Gutenberg). Apps: Shows the iPod touch apps downloaded from the App Store or iTunes Store, and iPod games downloaded from the iTunes Store. Tones: Shows the ringtones and text tones downloaded from the iTunes Store or from other sources, as well as those created in GarageBand on a Mac and added to your iTunes library. If you’d rather see the source list as a fixed pane for switching back and forth between sources quickly, choose View→Show Sidebar. The Library section shows the same source list; the sidebar also includes the Store, Genius, and Playlists sections of your library. To hide the sidebar, choose View→Hide Sidebar. To browse the audio books and e-books in your library, select Books in the Library section of the source list pop-up menu, and then click the Audiobooks tab to see your audio books or the Books tab to see your e-books. You can also click the PDFs tab to see books in the standard Portable Document Format (PDF). You can browse by author by clicking the Authors tab; click the List tab to see a list of book titles. Under the List tab, you can use the column browser by choosing View→Column Browser→Show Column Browser (or press Command-B on a Mac or Ctrl-Shift-B on a Windows PC). To hide the column browser, choose View→Column Browser→Hide Column Browser (or press Command-B on a Mac or Ctrl-Shift-B on a Windows PC). To browse podcasts, select Podcasts in the Library section of the source list. 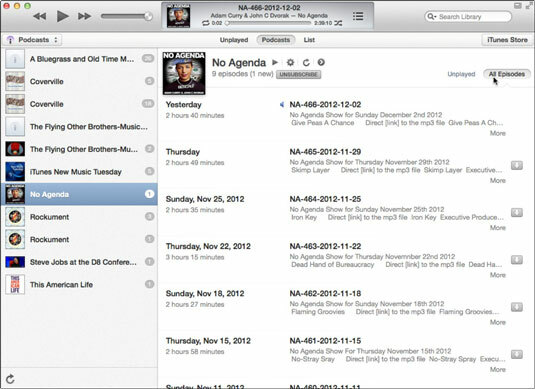 You can select podcasts in the left column and then select an episode of the podcast in the wider right column. You can click the Unplayed tab to show only unplayed podcast episodes, or the List tab to show a list of podcasts and episodes. For details on playing episodes. To browse movies, select Movies in the Library section of the source list. You can then click Genres to browse by genre or Unwatched to show only the movies you haven’t watched yet. You can click the List tab to see a list of movies by title. Under the List tab, you can use the column browser by choosing View→Column Browser→Show Column Browser (or press Command-B on a Mac or Ctrl-Shift-B on a Windows PC). Most video files you add to your library from sources other than the iTunes Store are classified as movies, and some, such as EyeTV recordings, are classified as TV shows. You can change the media type so that, for example, a video shows up as a TV show or music video rather than a movie. You can also find in the Movies listing those movies and short films you downloaded from the iTunes Store. You can browse TV shows by selecting TV Shows in the Library section of the source list. You can then click Genres to browse by genre, or Unwatched to show only the shows you haven’t watched yet. You can click the List tab to see a list of TV shows and episodes by title and use the column browser. The mysterious blue dot next to a movie, a podcast episode, an audio book, an iTunes U course, or a TV show episode means that you haven’t played it yet. As soon as you start listening to or watching it, the dot turns into a half-moon until you finish it (accompanied by the theme of Rod Serling’s original The Twilight Zone). The apps you download for your iPod touch, along with the games you download for your iPod classic (or older model iPod), show up in the Apps section of your iTunes library. Apps for the iPod touch are available in the App Store, and click-wheel games for the iPod classic and older iPod models are in the iTunes Store. Although you can’t run the apps or play the games in iTunes, you can browse the list of apps and games you downloaded. To browse your iPod touch apps and iPod classic click-wheel games, select Apps in the source list. You can then click tabs to show only iPhone/iPod touch apps (which run on all three devices), iPad apps (which run only on the iPad models), and iPod Games (click-wheel games for iPod classic). Click All to see all apps and games, or List to see a list of all apps and games.